This convenient paste-liquid formula in our unique Clicker™ Dispenser offers the protection of a conventional glass ionomer liner without the mess of measuring.Refill includes 2 - 10g Clicker Dispenser, 1 Large Mixing Pad and 1 Technique Card. Faster, easier dispensing and the right mix every time. Conventional paste-liquid formula offers the protection of a conventional glass ionomer liner without the mess of measuring. Award-winning Clicker dispenser assures a consistent mix. Helps protect against post-op sensitivity: offers a strong bond to dentin, sealing the tooth structure to protect against microleakage. Low microleakage comparable to original Vitrebond™ Liner/Base. Fluoride release of a true glass ionomer. Excellent handling characteristics for easy placement. Cures in 20 seconds - a faster cure time than powder-liquid formulas. 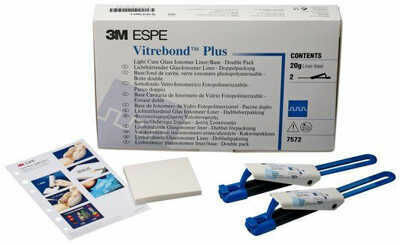 Delivers excellent adhesion with any dental adhesive system. Double Pack: 2-10gm. Clicker dispensers, 1 large mixing pad, 1 technique card, & instructions.